Brown Dermatologists Honored During American Cancer Society Event - Brown Physicians, Inc.
PROVIDENCE, R.I. (December 3, 2018) — Members of the R.I. General Assembly, and physicians from Brown Dermatology were honored during the annual Cancer Research Breakfast at Roger Williams Park Casino for their leadership in helping pass legislation that makes it illegal for minors to use tanning beds in Rhode Island. “If you are under 18, you cannot go to a tanning booth,” said Bernard Jackvony, a national board member of the American Cancer Society Cancer Action Network (ACS CAN), which hosted the event. Jackvony praised the efforts of General Assembly members, and Brown Dermatology physicians who have helped make Rhode Island a national leader in cancer prevention. 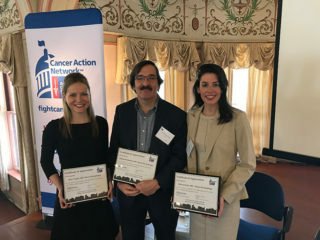 Dr. Helena Kuhn, Dr. Mary Teeple, and Dr. Martin Weinstock were each presented with a Certificate of Appreciation from ACS CAN for providing testimonies in support of the tanning bill sponsored by Senate Majority Whip Maryellen Goodwin and Deputy Majority Leader Mia Ackerman. All three doctors are faculty members of the Warren Alpert Medical School of Brown University. “We are proud to have contributed to the successful effort to protect minors from indoor tanning, an important, potentially addictive carcinogen targeted at teenagers and young adults. We would also like to congratulate ACS-CAN and our state legislators for advocating this important skin cancer prevention effort,” Brown Dermatology physicians said in a joint statement. Jackvony was joined by Ana Novais, deputy director of the R.I. Department of Health, and Vic Vetters, who served as the master of ceremonies and is the general manager of WJAR. They collectively echoed the calls of Jackvony about the importance of funding cancer research and calling on elected officials to support cancer prevention efforts. A panel discussion featuring a renowned group of physicians and researchers followed. The group discussed a wide range of issues such as the importance of palliative care in treating patients with cancer, advances in cancer research such as immunotherapy, and why providing cancer patients with more access to clinical trials could pave the way for more breakthroughs in the field of oncology. The importance of cancer research was reinforced with the story of Josue Flores, who was brought to the stage to share his experience with cancer. Flores, who is now cancer free, plans to attend college and eventually serve the country. As a founding member of Brown Physicians, Inc., Brown Dermatology specializes in the treatment of over 3,000 skin diseases and provides dermatology and clinical services for patients at Rhode Island Hospital, Hasbro Children’s Hospital, the Miriam Hospital, Women & Infants Hospital, and the VA Providence Medical Center. nextLisa Blackmon to lead technology initiatives at Brown Physicians, Inc.